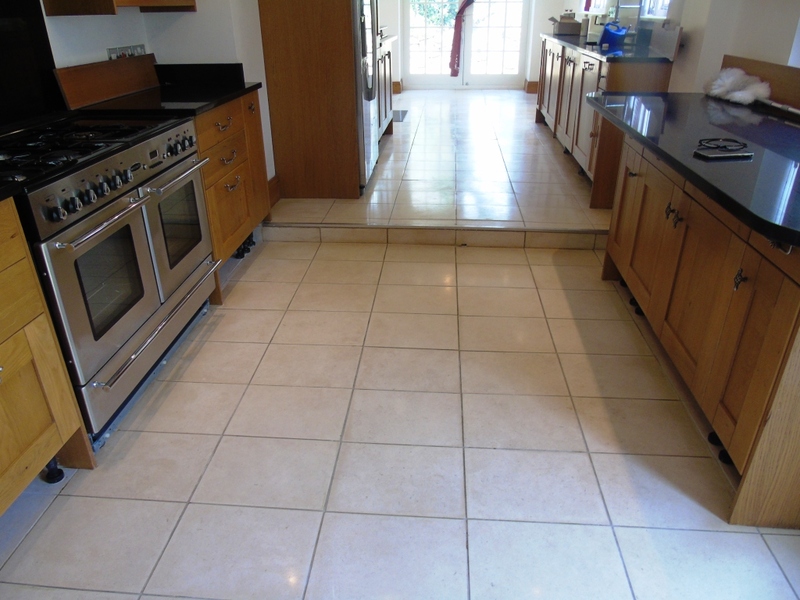 The photographs below are of a Polished limestone floor that had been installed in the Kitchen of a house in Cheltenham approximately eight years prior. The polish and sealer had worn off over that time allowing dirt to become ingrained into the pores of the stone making it difficult to clean. 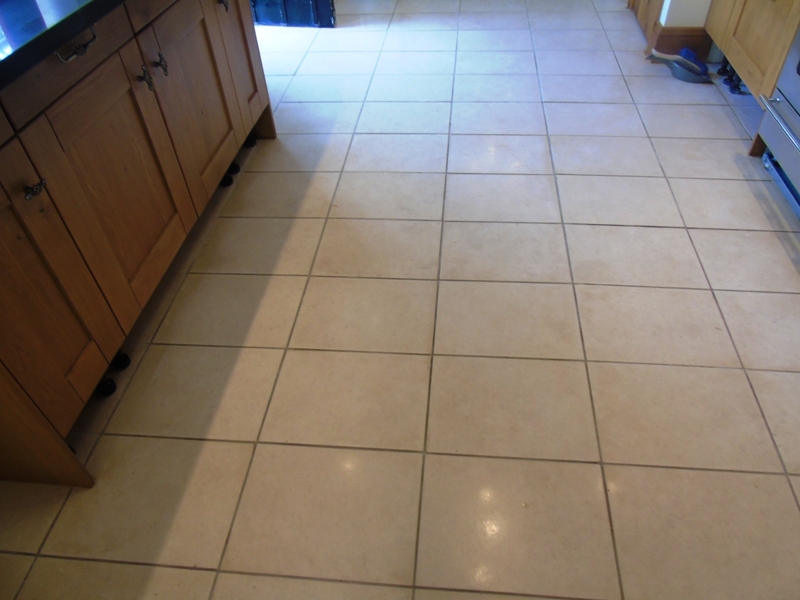 This is a common problem with all types of porous stone and tile which need to be sealed to maintain their appearance. 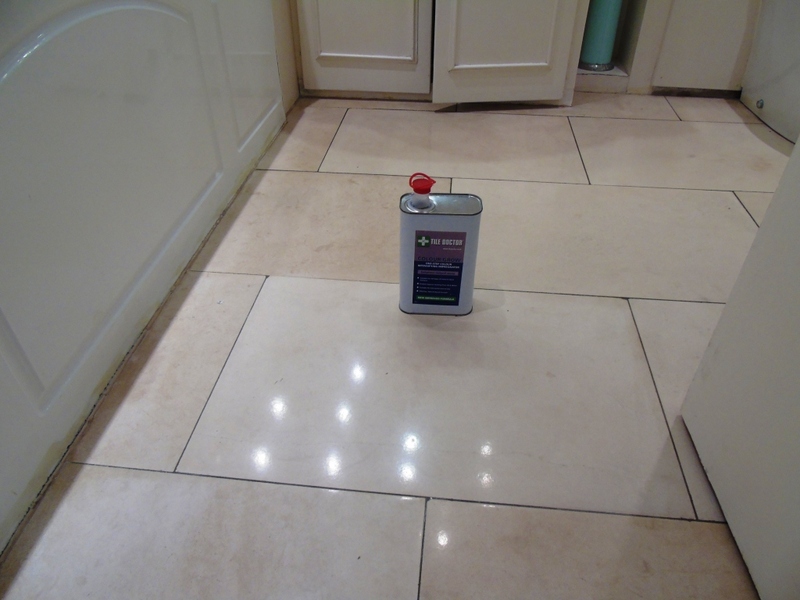 Sealers do wear down over time with use however and need to be maintained, this is why Tile Doctor have created a maintenance program whereby we pop by every 12 months to give the floor a light clean and top-up the sealer, it only takes a few hours, but it keeps your sealer in good condition. Cheltenham by the way is a lovely town situated on the edge of the Cotswolds which is an area of Outstanding Natural Beauty. It has a racecourse and is well known for the mineral springs which were discovered here in 1716. My first job was to protect the wooden kitchen units from any splashes by covering them some cotton sheets. Next, I set about restoring the Limestone’s appearance using a set of Burnishing Pads which is a form of polishing which involves the sequential application of four diamond encrusted pads of different grit levels. The first pad applied is a Coarse 400 grit pad which is applied to the floor with a buffing machine and lubricated with water. 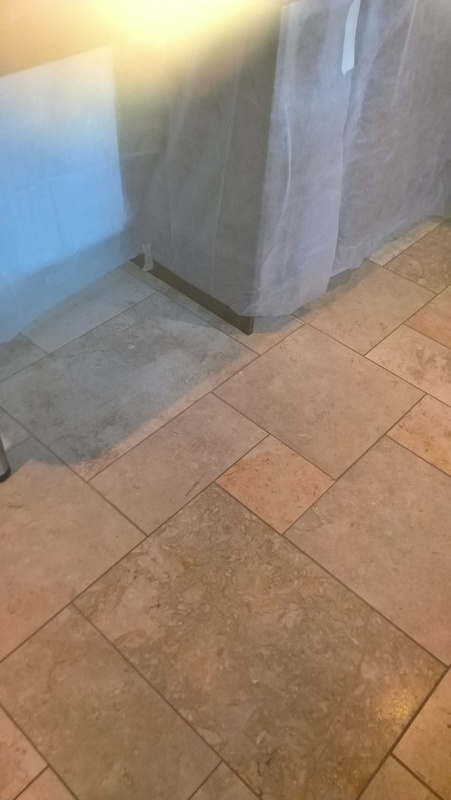 This process grinds away the top layer of dirt and staining from the stone, along with any old sealer, the floor is then rinsed to remove the soil that is generated. I then move through the system, applying the Medium and then Fine pads using less and less water as you go but rinsing in-between and extracting the water with a wet-vac machine. 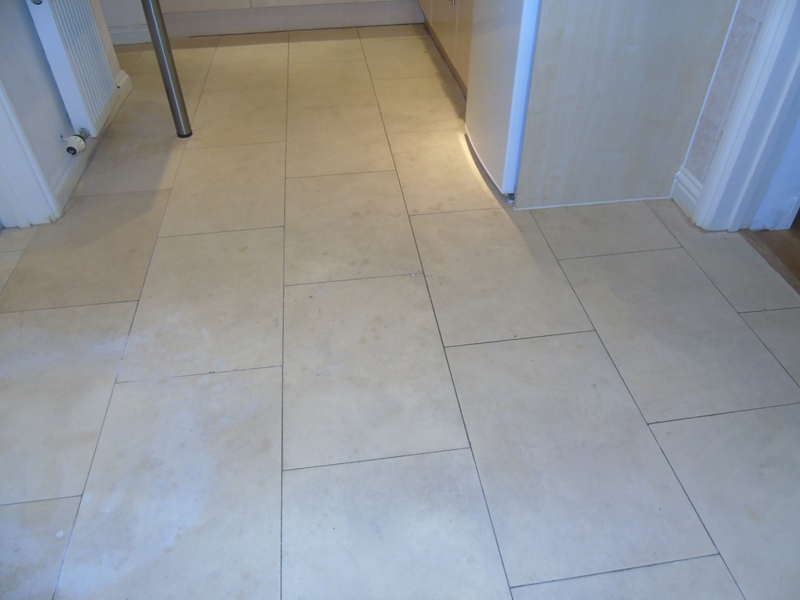 Once I was happy with the stone I scrubbed the grout lines to remove any soiling that the pads had failed to pick up. The floor was then given a final rinse and the wet vacuum used to extract as much moisture as possible. The floor was then left to dry out completely overnight. The next day I gave the floor a polish with the Very Fine 3,000 grit diamond burnishing pad, this is applied using a technique we call a “spray burnish” due to the fact that very little water is used during its application. 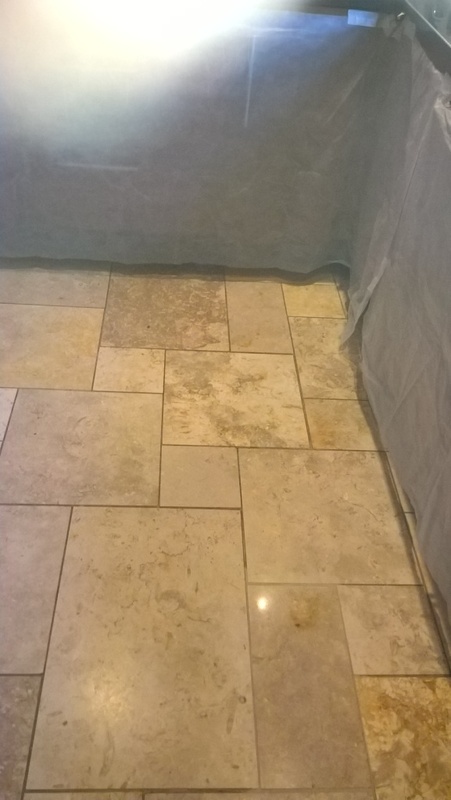 The next step was to seal the stone using for which I used Tile Doctor Colour Grow which is an impregnating sealer that protects the stone from within by occupying its pores. Colour Grow also has the added benefit of intensifying the natural colours in the stone. The floor was then left to dry for an hour before I gave it one final dry polish using the Very Fine burnishing pad. 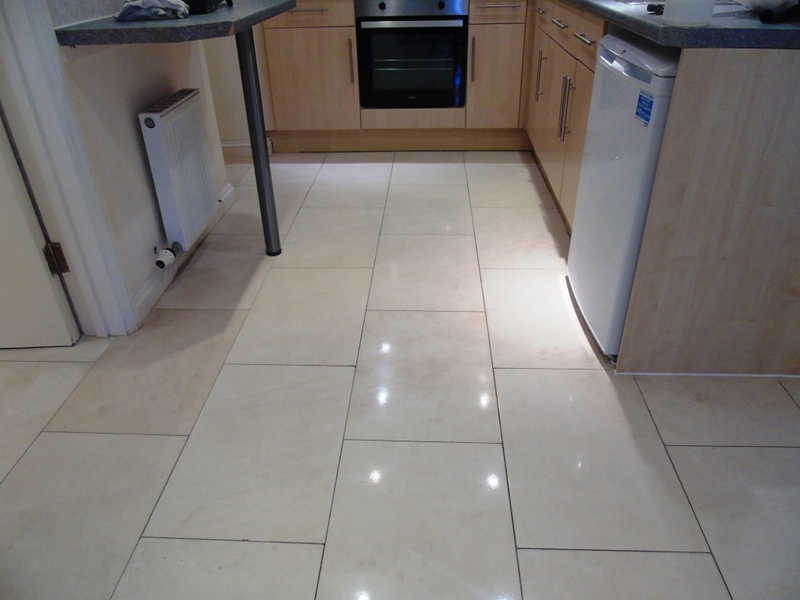 My customer was very happy with the final result and made the comment that they thought the floor looked brand new. This customer was looking to rent out his property in the East Gloucestershire town of Cirencester, the largest in the Cotswold District. 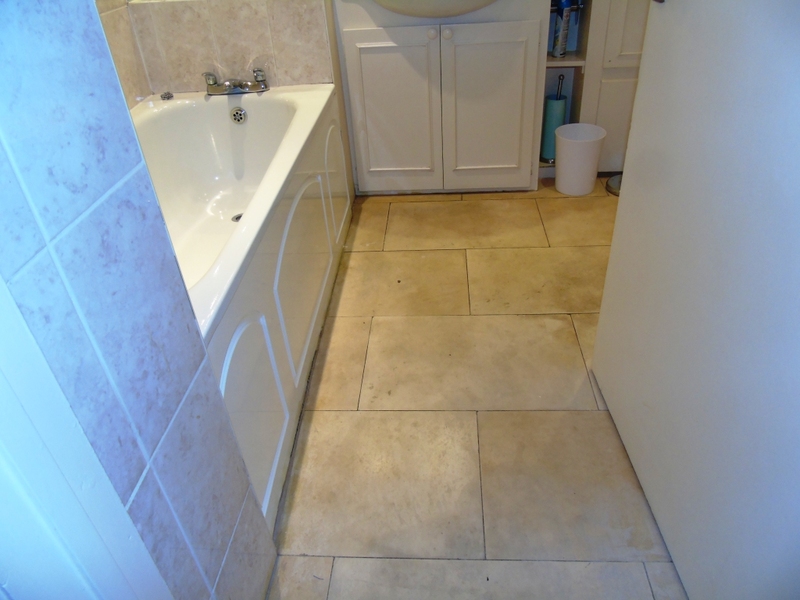 However, he found that many prospective tenants were put off by the condition of the Limestone floor tiles on the ground floor. 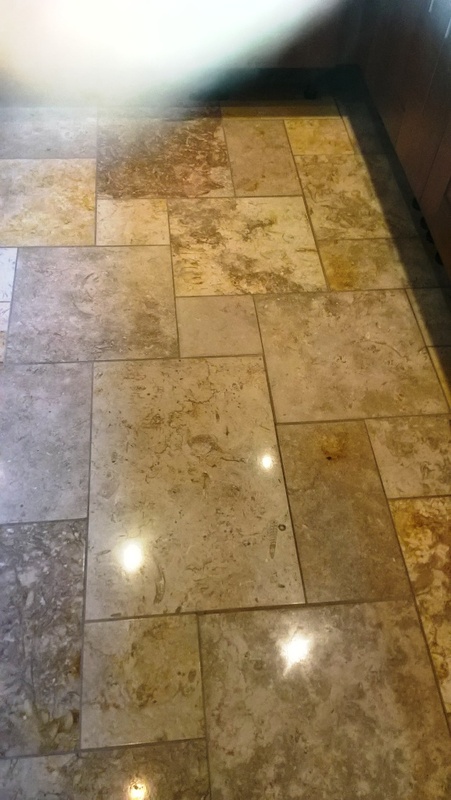 Over the years, the sealer had worn away and that had allowed for dirt and stains to become ingrained in the pores of the stone, leaving the Limestone tiles looking very dull, unclean and generally undesirable. 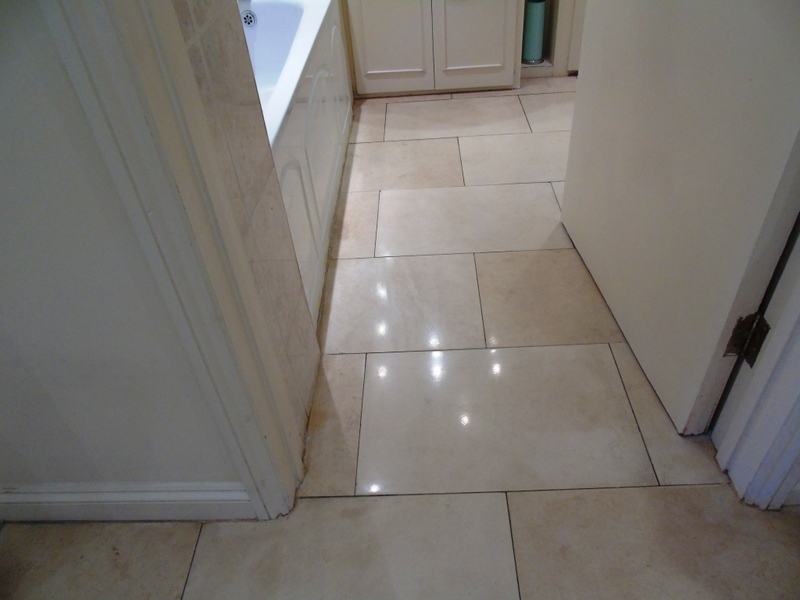 To boost his chance of finding a tenant for the property, the customer asked me to come in to restore the Limestone tiles to their best possible condition. I arrived at the property and conducted a survey to assess the situation. The customer – not wanting to waste any more time – asked if I could complete the restoration straight away, fortunately I was able to shuffle a few things around and was able to make a start two days later. With Limestone, as well as other high-end stone like Marble and Travertine, we find that the best method for restoration is burnishing. This is a form of polishing which involves the sequential application of diamond encrusted pads of different grit levels. We work with a system of four pads fitted to a buffing machine. The first is a Coarse pad, which grinds away the top layer of dirt and staining from the stone, along with any old sealer. I then moved through the system, applying each in turn the Medium, Fine, and Very Fine burnishing pads to gradually refine the polish on the floor. A small amount of water was used as lubricant between each pad, and I hoovered up any resulting slurry with a wet-vac machine. 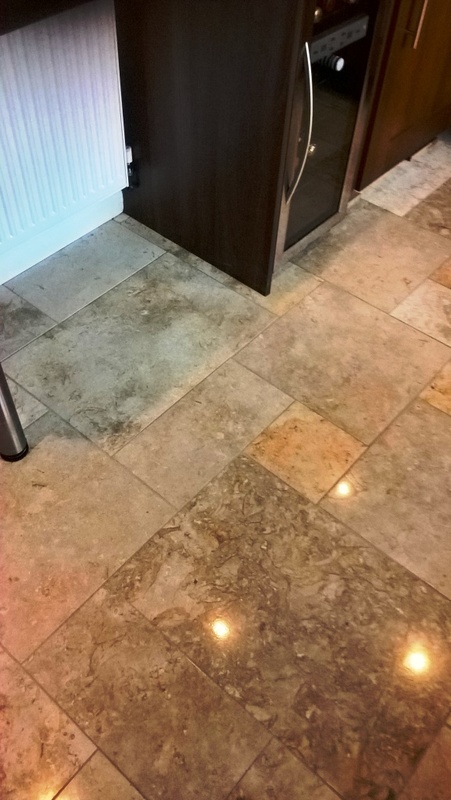 Having finished polishing the stone, I paid attention to cleaning the grout lines, applying Tile Doctor Remove and Go, which draws out any ingrained stains and heavy grease build-up, and scrubbing it in with a specialised grout brush. The floor was then left to dry out completely overnight. Upon returning to the property the next day, I checked the floor was completely dry and quickly vacuumed up any leftover debris from the previous day’s work. Next, I gave the floor another polish with the Very Fine 3000 grit diamond burnishing pad, vacuumed it again, and it was then ready to be sealed. 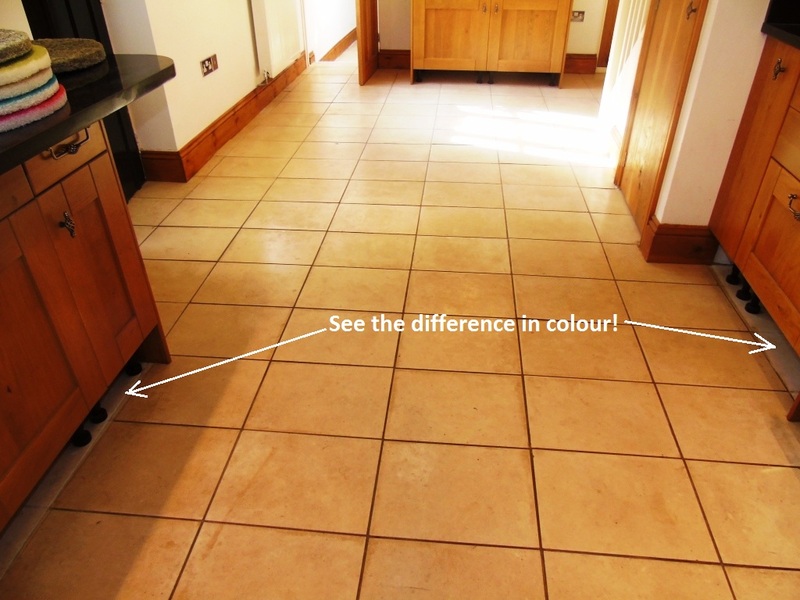 To do this I used Tile Doctor Colour Grow, which is an impregnating sealer that not only acts to protect the stone, but also intensify its natural colours. The floor was then left to dry for an hour, before I subsequently gave it one final dry polish using the Very Fine burnishing pa fitted to the buffing machine. After vacuuming up any debris, I applied a second coat of Colour Grow, left it to dry, and finally buffed it with a soft white pad. The customer was really pleased with the results, having never expected for the restoration to turn out so well. 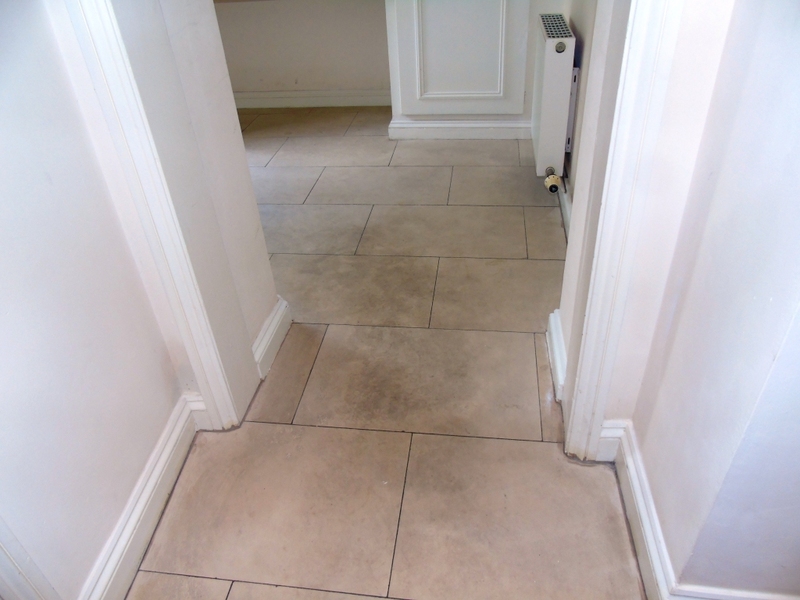 Undoubtedly there will a queue of prospective tenants hoping to see the property now that the Limestone tiled floor looks so great!